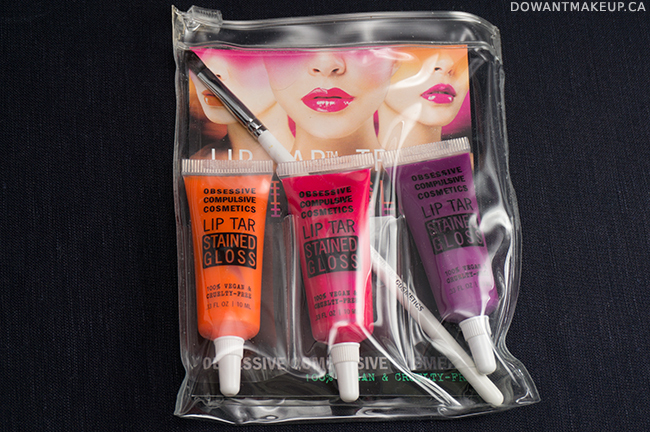 The three shades, Androgyne (orange), New Wave (hot pink), and Dekadent (purple) are packaged with OCC's #010 Precision Lip Brush in a clear, thick plastic zip-top. 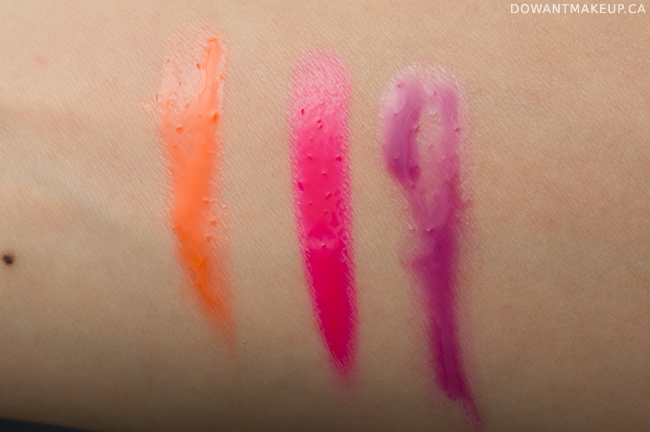 At $30, you're getting 3 full-sized Lip Tar glosses (available separately for $22 each)--see why I couldn't resist buying this trio? OCC Lip Tars are formulated with peppermint oil, which I suspect is added as a preservative to make a paraben-free product. A lot of people love the minty feeling of peppermint oil, but it can be irritating to my lips if I'm having a bad eczema day. I took kind of a risk trying these (I like to live dangerously) but luckily didn't have any problems with it. 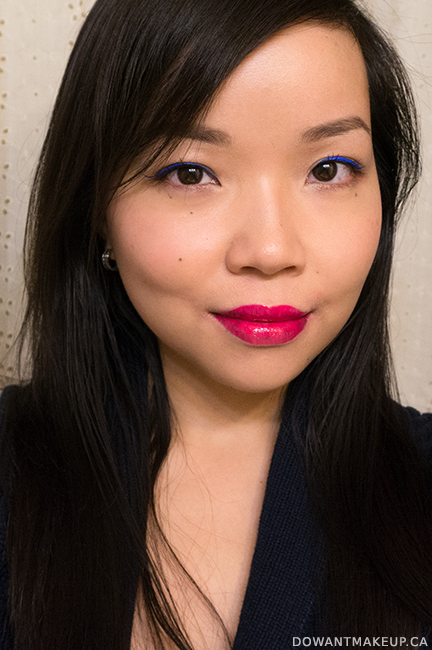 The #010 Precision Lip Brush is pretty good! I don't use lip brushes often but usually prefer a short-bristled lip brush. #010 has longer bristles, but they're firm enough to distribute product over the lips well without being too floppy or scratchy. I also like that it's full-size, compared to the individually-sold Lip Tars, which I think come with a mini-sized brush. For scale, here's the #010 brush next to my lips. 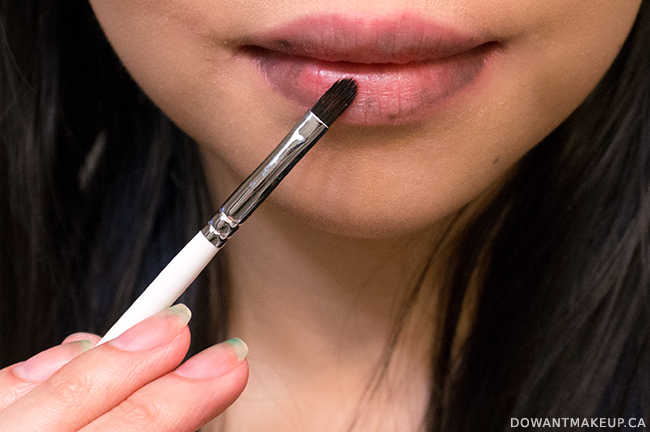 The brush is wide enough to apply product quickly, but narrow enough I think to work even with thinner lips. You really do need to use a brush with this. If you didn't know, OCC Lip Tars come with a needle-tip rather than a slanted tip, so it'll get messy quick if you attempt to put this on without one. I squeezed a little bit of product on to the brush to apply to my lips and go back for more if necessary. Arm swatch time! I'm not sure what those little gritty things in the swatches are, but there is no grittiness to the product itself. The swatches are a bit telling of how this review is going to go: see how smooth and even the New Wave swatch looks compared to the other two? No matter how I tried to manuever the brush, I couldn't quite even it out. As the name suggests, the effect is pretty sheer, so you need to really layer it on to get colour. New Wave is a neon, hot pink and it is by far the best shade of the set. 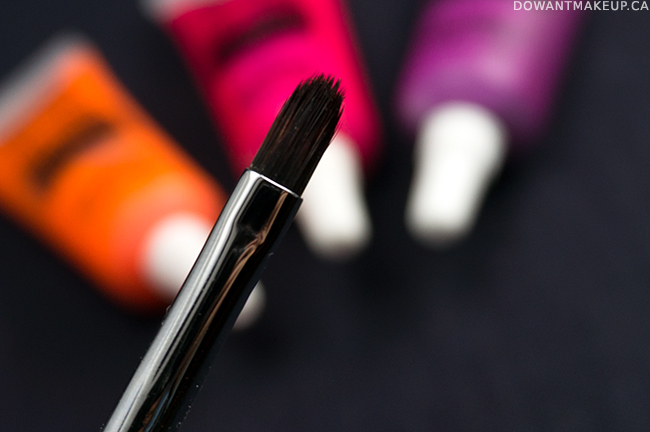 Much more pigmented than Androgyne or Dekadent and applies way more smoothly. 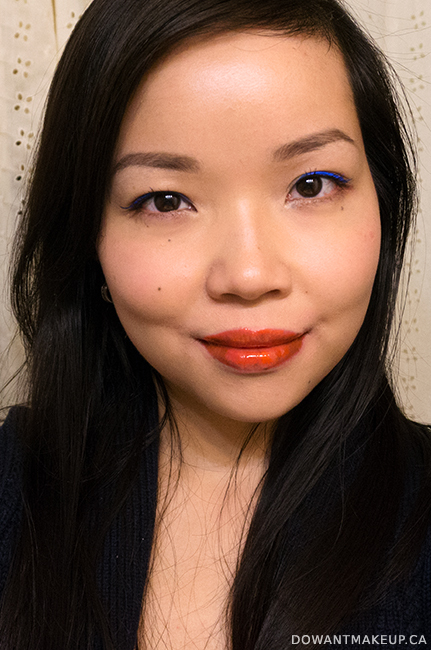 This was actually the first one I tried out of the three, and I was pleasantly surprised by the eye-popping colour. Unfortunately this raised my expectations of the other two, which weren't as good. I didn't leave New Wave on for long, but it did leave a slight pink stain. 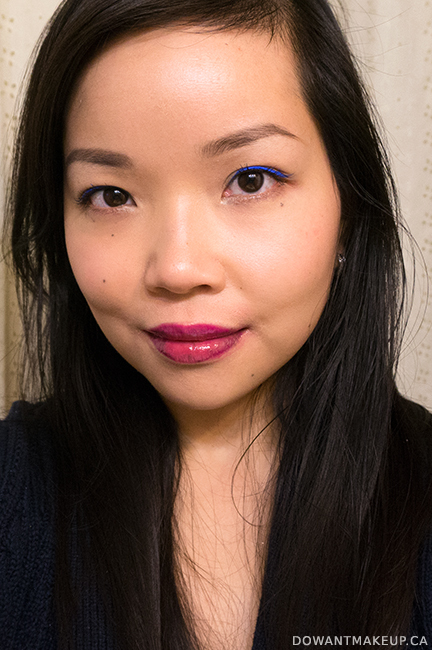 Compared to the swatches of Androgyne and Dekadent, it did a much better job of covering the dark spots on my lips. 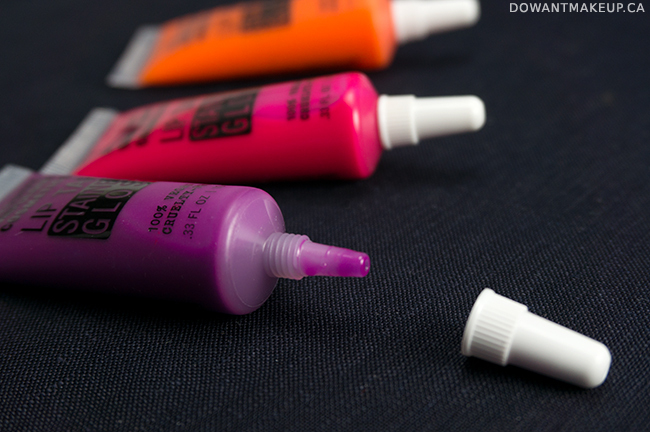 Dekadent looks like a deep purple in the tube, but is the most sheer out of all three. I was really excited about this shade, but it wasn't nearly as dark or purply as the tube colour suggests. I was so persistent about getting as close to the tube colour as possible and legit spackled it on, but this was about the best I could get before it started feeling really heavy. It looks uneven/dark in some areas, but this is mainly because of the uneven pigmentation of my lips showing through the sheer gloss. It applies okay but takes some work to even out. If you want more of a sheer magenta lip, then Dekadent is nice, but it's not what I was hoping for. I really wanted to like this set, but it wasn't for me. 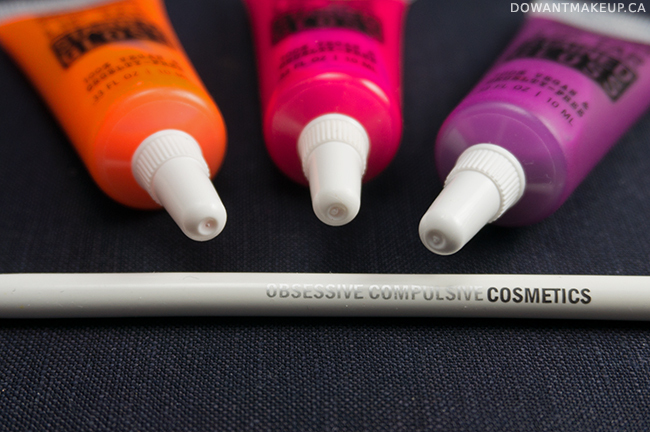 If you like having just a wash of colour and love OCC, then the set is a great value, especially because of the included brush. However, I do think that there are plenty of other lip glosses out there that will give you the same effect without the hassle of needing a brush to apply. The product page claims "fully-pigmented color impact", but two out of three are really quite sheer, on top of the problems with unevenness. The star of the trio is definitely New Wave (which again, you can buy separately!) It's a little out of my comfort zone but it was surprisingly flattering on my warm skin tone.